If you are interested in participating in one of the studies at the Language and Brain Lab, please look through SONA announcements or recruitment posters placed around campus. Note: All studies conducted at the Language and Brain Lab comply with the Tri-Council Policy Statement: Ethical Conduct for Research Involving Humans (TCPS 2, 2014). An ethics clearance is obtained for each study from the Carleton University Ethics Committee for Psychological Research. Need Assistance in Japanese? Please feel free to contact us. 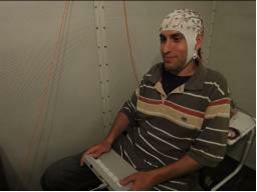 In most of our EEG experiments participants will be asked to sit in front of a computer screen placed in a sound attenuated room. They will either listen to or read sentences played by a computer and carry out a task after each sentence (e.g., answer a comprehension question, judge whether a sentence is good). Practice trials are always provided before an actual experiment begins, to help participants become familiarized with the task and format of the experiment. We will prepare electrodes for the participants’ cap before the start of an experiment. 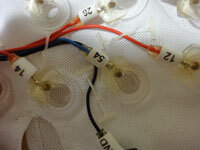 Once the cap is placed on the head, we will insert gel into the small hole attached to each electrode on the cap. This process takes about 20-30 minutes. Some of the gel on the cap may remain in the participants’ hair. There is a shampooing sink at the lab where participants can wash and dry their hair after an experiment. 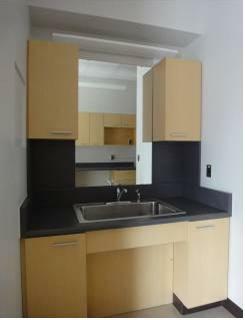 The lab is equipped with shampoo (several different kinds), a hair dryer, and towels. Please bring your comb, hair brush, a shampoo of your choice, and make-up if needed. Each experiment has specific qualifications for participants. Please view the SONA announcements and recruitment posters. 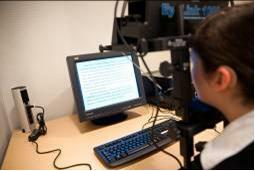 The general purpose of our eye-tracking experiments is to investigate how different factors (both linguistic and non-linguistic) influence readers’ eye-movement behavior during reading. 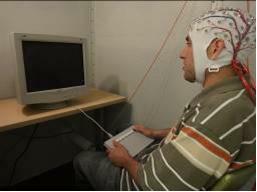 In most of our eye-tracking studies participants will be asked to read sentences presented on a computer monitor as their eye-movement behavior is recorded. After each sentence, readers will be instructed to answer a question about the sentence they have read. It takes about five to ten minutes to set up an eye-tracking camera. Participants will be encouraged to sit still while they are reading. This is to ensure the accuracy of the data recording. Participants can take a short break whenever it is necessary. 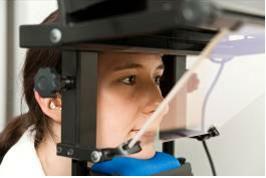 Practice trials are always provided before an actual experiment starts, to help participants become familiarized with the task and format of an eye-tracking experiment. For Japanese reading experiments, native Japanese speakers with good or corrected vision (with contact lenses or glasses) are usually recruited. Japanese experiments generally ask for participants who have completed three years of high school in Japan. If you wear both glasses and contact lenses and are comfortable with contact lenses, please bring or wear them to the lab. Monolingual native Canadian English speakers with good or corrected vision (with contact lenses) are usually recruited for English reading experiments.